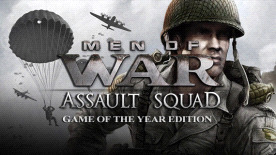 Charlie is the third official multiplayer DLC for Men of War: Assault Squad and features 5 new competitive multiplayer maps for various numbers of players. Each map has its own unique setting and battle landscape. The 5 new multiplayer maps are for the gamemodes Assault Zones and Combat, as well as for the DLC exclusive Day of Victory gamemode. A new game in the Men of War series. It takes place across the globe during World War II and features a completely new cooperative skirmish game mode. It includes access to five different nations (Russia, Germany, USA, Commonwealth and- for the first time ever in the Men of War series- Japan) as well as increased realism and accessibility. Assault Squad delivers an intense new WW2 spectacle with almost limitless replayability.